The Pakistan Customs and State Bank of Pakistan (SBP) are unanimously agreed to implement the new electronic Form-E system in Pakistan to stop the use of fake Form-E and save the precious foreign exchange of the country. Therefore, we have already discussed the complete procedure, How an exporter sends online Form-E issuance request the to bank (With Supportive Images) using this new system. This new online E Form issuance system allows trader to file online Form E issuance request to their dealing bank branch and bank (Branch) will also approve Form-E request online in WeBoc, therefore, Banks branches must be registered in WeBoc system and get ids and password. Still 1300 bank branches have been registered in the WeBOC system and their IDs and Passwords have been notified to them. 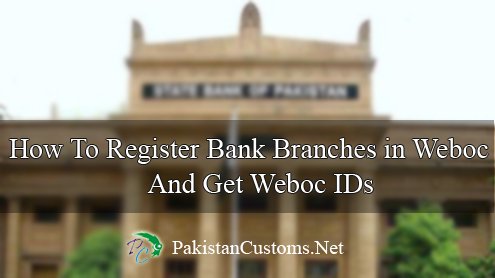 State bank of Pakistan nominated these 1300 bank branches to process this registration, if your bank branch still not added in weboc so contact deputy collectors of customs (In Customs House Weboc Department) and request him to register your bank branch in weboc. For further assistance, problems and query please contact WeBOC`s Help Line numbers.